Hello everyone. I am Damian Killeen, Chairperson of Big Things on the Beach. I am sorry I can’t attend this first meeting but I am looking forward to meeting with you in future. 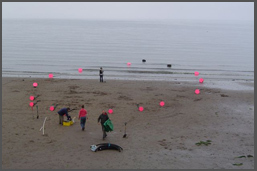 Big Things on the Beach was formed in 2004 by a group of local residents in Portobello, Edinburgh who wish to contribute to the development of the area by building its profile as a place to view contemporary art. In 2005 and 2006 we commissioned two temporary (six months) installations; one, ‘Blue Moon’ by Rennie Nisbett, took the form of a tidally driven lunar clock designed to display the changing phases of the moon on the surface of the sea. 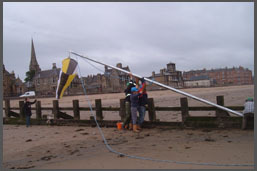 The second work , ‘Progressions’ by Harvey and Hosie consisted of a series of ‘windsocks’ raised from a series of groins along the beach and designed to display colours and symbols associated with the industrial history of Portobello. 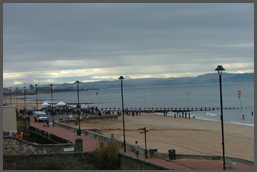 These commissions were funded by the Scottish Arts Council and the local authority. We are currently raising funds for two further commissions; another temporary work in 2007 (c. £15-20,000.00) and a permanent work in 2008 (c. £100,000.00). We have had a very positive response to this introduction of contemporary art into a popular public space. As a consequence of this interest and with further Scottish Arts Council (Lottery) funding we are currently running the first pilot of two courses for local people on the commissioning of public art. Fourteen people are taking part in the pilot term. We are also launching a new project for 2008, the Portobello Garden Gallery. This project invites local people to make their front gardens along the promenade and adjacent streets available for the display of artworks in any medium that can withstand the weather from June to September, with a unifying interpretative leaflet and map etc. Thirty households have already indicated their interest in taking part and we are certain that others will follow. At the heart of this we are keen to develop a positive appreciation amongst local people of the contribution that artists can make to the public’s awareness of the social and physical environment in which they live. We have an idea of public art as, in part, a dialogue between artists and other people in which both parties are prepared to respond to each other and be open about their respective processes etc. We distinguish this from ‘art in public places’ (of which our Garden Gallery idea is an example) and ‘community art’ in which the artist serves the creativity of others. We are not attracted to the idea that art can be used to solve social problems and we are concerned that some of the policy thinking about art and culture in Scotland is too literal in how it seeks to address ‘exclusion’etc. I have a background in youth work and community development, In Scotland I was the first Coordinator of the Edinburgh Stopover Hostel for homeless young people; worked as a campaigner on youth homelessness issues for Shelter Scotland and directed the work of the Scottish Poverty Alliance for thirteen years. I am now an independent consultant in sustainable development and social justice issues. I manage an Executive funded programme, ‘Sus It Out’, to promote community level awareness of sustainable development and I undertake poverty related research for the Joseph Rowntree Foundation. 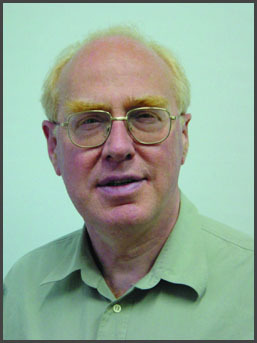 In 2004 I was awarded the OBE for my contribution to social inclusion in Scotland. In the 1970’s I was active in the community art movement in England. I developed the youth centre I managed as a touring venue for theatre, dance, music and exhibitions. I served on the Community Arts Panel of the Arts Council of Great Britain and chaired the Yorkshire Arts Community Arts Panel when funding was devolved from London. On moving to Scotland, I promised to be good and to concentrate on the day job. I have done this for 25 years and have decided it’s time to get engaged again. I am passionate about the power of art to enhance and change peoples’ lives and I am keen to share this passion with others.